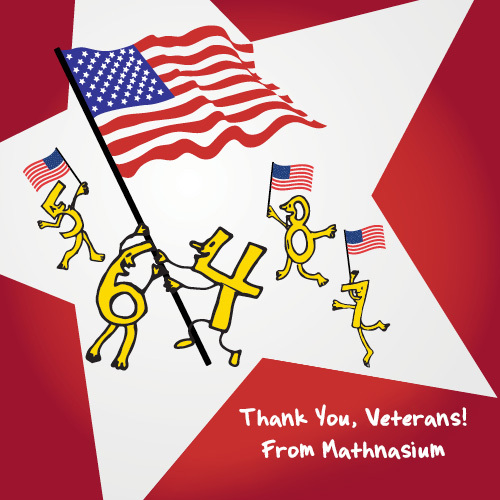 If you are a veteran and your name isn’t on the list, please let us know by emailing matters@mathnasium.com! 6 users comments for " Veterans, We Salute You! " Happy Veterans Day to all the Veterans in our Mathnasium community and to all of those that have served and continue to serve allowing us all to live in Freedom. Just FYI, it would be really nice if these sorts of things (Vet’s Day, Earth Day, etc) would be released a day or two early. Then we could use them on our Facebook pages. If they’re somewhere these are that I don’t know about, I’d sure like to!! Thanks for your feedback and for reading Mathnasium Matters! Please feel free to share our Facebook Veterans Day post on your center’s Facebook page. Head on over to http://www.facebook.com/mathnasium — it’ll be at the top of the page all day today! Just so you know, our goal is to release the marketing calendar, seasonal graphics and other collateral in advance to give all of you ample time to prepare for the coming month. Damaris, can you tell me where those are?? I assume I’m missing a folder or something in Download Depot? ?